Madame Nielsen is novelist, artist, performer, stage director and world history enactor, composer, chanteuse, and multi-gendered. 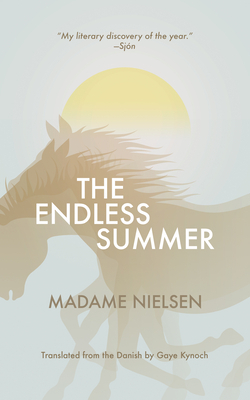 Madame Nielsen is the author of numerous literary works, including a trilogy--The Suicide Mission, The Sovereign, and Fall of the Great Satan--and most recently, The Endless Summer, the "Bildungsroman" The Invasion, and The Supreme Being. Madame Nielsen is translated into nine languages and has received several literary prizes. The autobiographical novel My Encounters with The Great Authors of our Nation was published in 2013 under her boy's-name, Claus Beck-Nielsen, and was nominated for the Nordic Council Literature Prize in 2014. Madame Nielsen is novelist, artist, performer, stage director and world history enactor, composer, chanteuse, and multi-gendered. Madame Nielsen is the author of numerous literary works, including a trilogy--The Suicide Mission, The Sovereign, and Fall of the Great Satan--and most recently, The Endless Summer, the "Bildungsroman" The Invasion, and The Supreme Being. Madame Nielsen is translated into nine languages and has received several literary prizes. The autobiographical novel My Encounters with The Great Authors of our Nation was published in 2013 under her boy's-name, Claus Beck-Nielsen, and was nominated for the Nordic Council Literature Prize in 2014.Gaye Kynoch is a freelance translator of Danish into English, specializing in books and essays on various aspects of the arts, together with plays and works of fiction.